Scraps of Darkness and Scraps of Elegance: Dana rocks the Wood Tray and created a beautiful layout! Dana rocks the Wood Tray and created a beautiful layout! Hi! 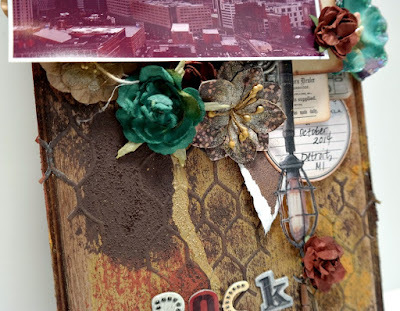 Dana here went off-the-page with this project for Scraps of Darkness, focusing my efforts on the May Attic Finds Creativity Add-On, which includes a set of Tim Holtz Idea-ology Wood Vignette Trays, embellishments from Blue Fern Studios and 7Gypsies, and a Finnabair Art Extravagence Rust Effect Paste Set from Prima. I flipped over the larger tray and built this piece on the back. I took this photo of downtown Detroit from a hotel window in 2014, before I headed out to see one of my favorite rock bands play. 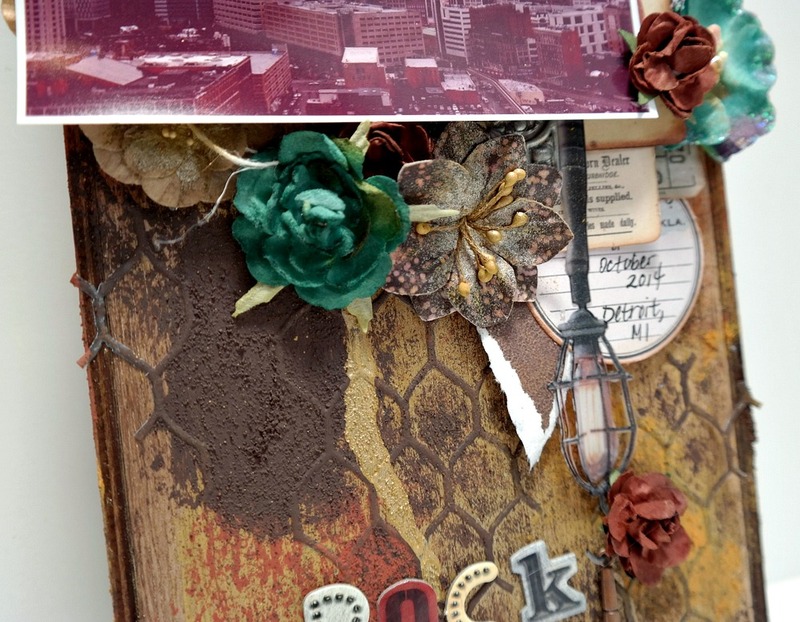 I layered die-cuts from the Tim Holtz Idea-ology Emporium Ephemera Pack (Main Kit) and pieces cut from patterned paper from the May Patterned Paper Add-On to build up layers under the photo. I also tucked flowers from the Main Kit and the May Floral Add-On between the layers of paper. 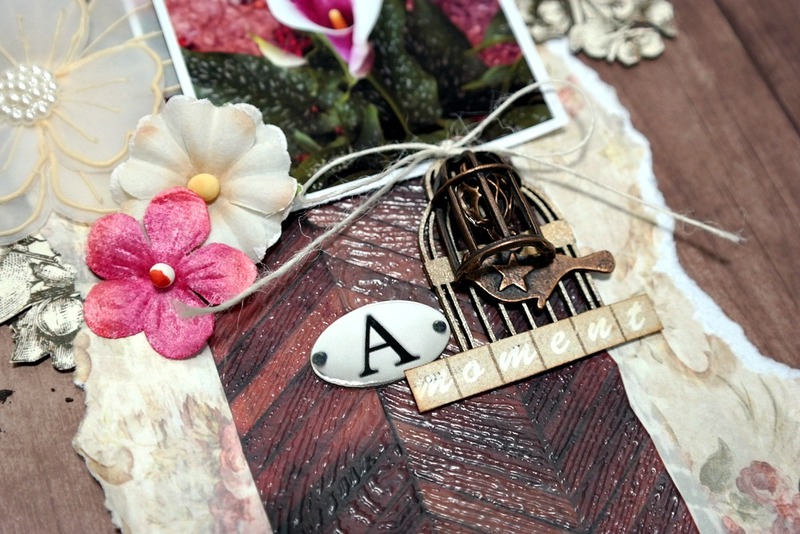 I colored the brown flowers with the Tim Holtz Vintage Photo Distress Crayon (Main Kit) and the Tim Holtz Tarnished Brass Distress Spray Stain from the May Color Add-On. 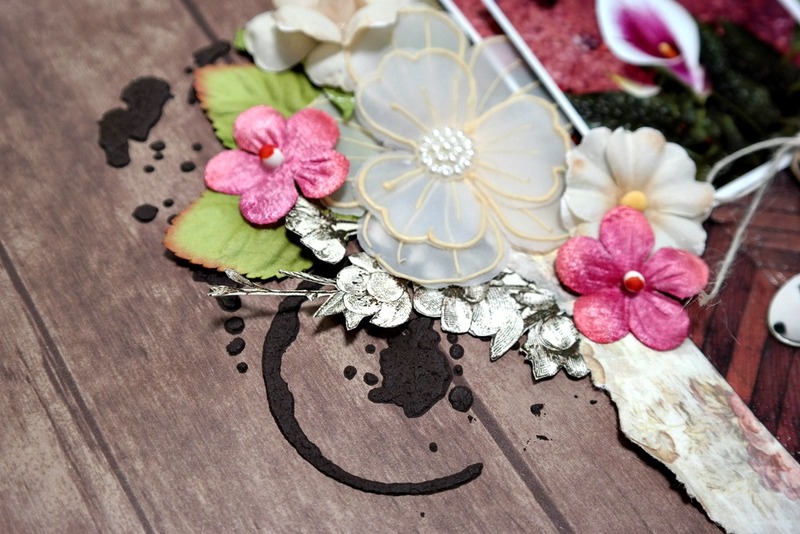 I had a lot of fun adding color and texture to this wood vignette tray! I started with Tim Holtz Tarnished Brass Distress Spray Stain and Prima Art Alchemy Metallique Ancient Coin Acrylic Paint from the May Color Add-On. Once those mediums were dry, I cut the 7Gypsies Architextures Tall Base Chicken Wire from the May Creativity Add-On into segments and stuck it to the tray. 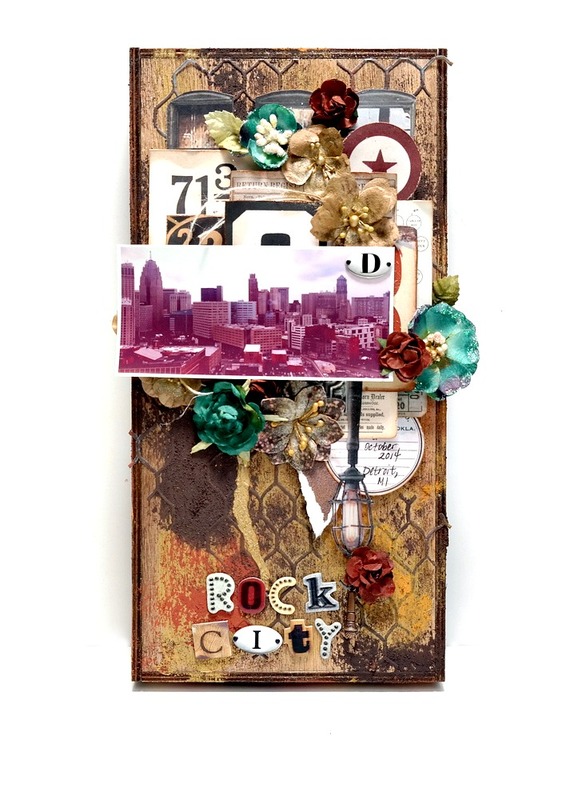 Finally, I sponged on Prima Finnabair Art Extravagence Rust Effect Paste Set, also from the Creativity Add-On, over the chicken wire for a gritty finish. 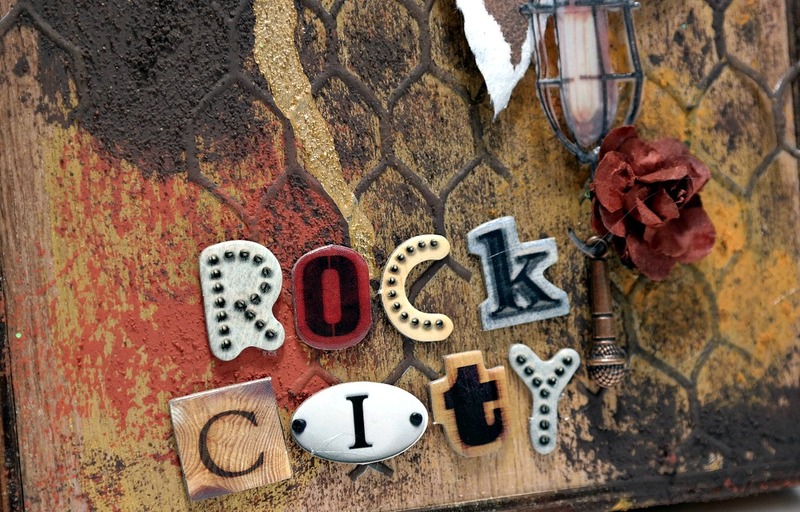 I used the Mr. Smith's Workshop Alphabet Stickers from the May Elements Add-On for the title. I hung the Scrapberry's metal microphone (Main Kit) from the hook at the bottom of the cage light embellishments from the 7Gypsies Architextures Junque Pack (May Elements Add-On). 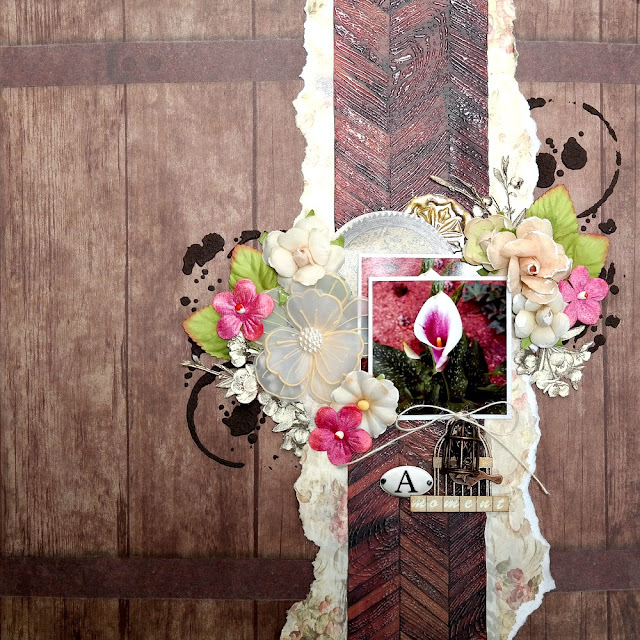 Now I'm sharing the third layout I've created with the Scraps of Darkness May Attic Finds Kit today. My calla lilies are starting to bloom and I wanted to be sure to document their beauty. I love a great wood grain pattern and used two different pieces for this page. I started with the Authentique Rugged Five patterned paper for the base of the layout (Main Kit). Next, I added texture by spreading Prima Finnabair Art Extravagance Rust Effect Paste (May Creativity Add-On) over the Kaisercraft Splatter Mini Designer Template (Main Kit). I cut a strip of floral paper from the 7 Gypsies Architextures Market Signs patterned paper (Main Kit) and then tore it in half. 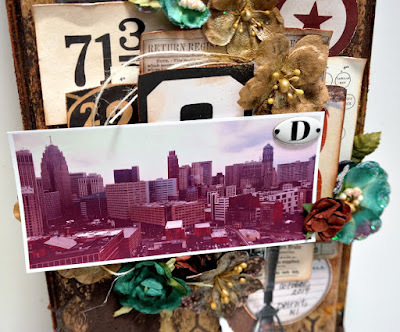 I attached the torn paper strips to the background and then applied the wood grain sticker from the 7 Gypsies Junque Embellishments Pack (May Elements Add-On), which I cut in half to span the length of the page. Next, I cut the small floral design from the Scrapberry's Archive and Abacus patterned paper (May Patterned Paper Add-On) into pieces and tucked them around the floral print paper. I cut a small frame from the 7 Gypsies Architextures Ornate Frames patterned paper (May Patterned Paper Add-On) and tucked it behind the photos. Next, I cut a circle from the 7 Gypsies Architextures Tin Ceiling Tiles Embellishments (Main Kit), highlighted the raised portion of sticker with Prima Art Alchemy Metallique Ancient Coin Acrylic Paint from the May Color Add-On, and tucked it behind the photos. 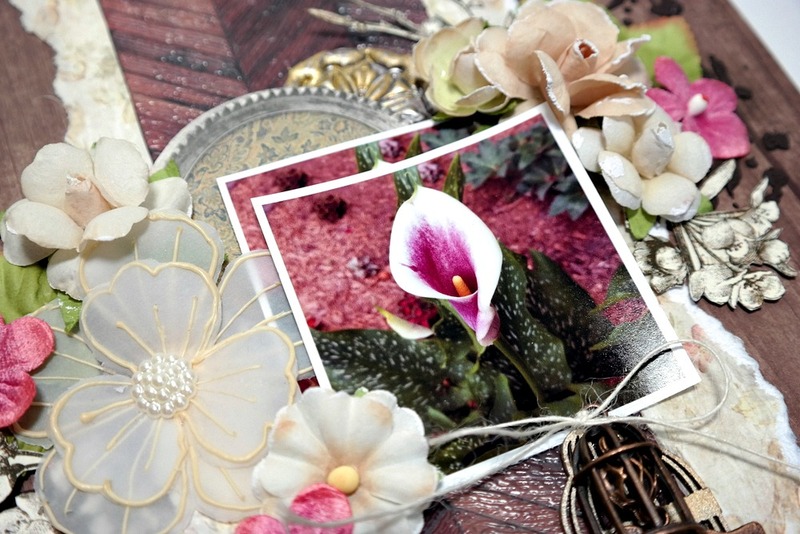 I filled in the space around the photos with flowers and leaves from the Main Kit, the May Floral Add-On, and some flowers that I bought from the Scraps of Darkness Store. I created a small bird cage embellishment with a Scrapberry's Vintage Circus Metal Charm and a chipboard cage from the Blue Fern Studios Veranda Cage Set (May Elements Add-On). 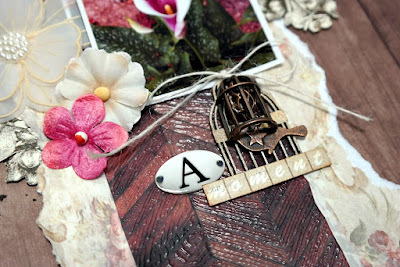 I colored the chipboard cage with the Tim Holtz Tarnished Brass Distress Spray Stain from the May Color Add-On. To finish this layout I added a title using the Mr. Smith's Workshop Alphabet Stickers from the May Elements Add-On and the word "moment," that I cut from the Scrapberry's Archive and Abacus patterned paper (May Patterned Paper Add-On). I'm really happy with this page and I hope you like it too! Several of the May Add-On kits are still available from the Scraps of Darkness Store, but they are going fast! 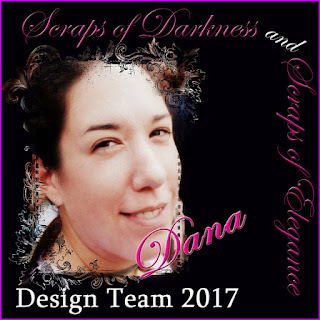 If you don't have a Scraps of Darkness subscription, why not join today?! You can find out more about the club, at ScrapsofDarkness.com. We'd love to see your take on this kit. Share your work with us in the Scraps of Darkness and Scraps of Elegance Mixed Media Scrapbooking Community on Facebook.